There are so many iPod touch users worldwide mainly because it is thin, light, smart and convenient to carry. iPod is a smart yet cute device to play music, videos and games. With iPod touch, one can enjoy videos and music by use of Safari via WiFi, etc., or download music or videos through iTunes, and so on and so forth. If you have many good video/audio files in your computer, you can make things much easier. Typically, there are two practical ways to play video/audio of your computer through your iPod, namely, converting and streaming video audio to iPod. Generally, both converting and streaming video audio to iPod are for playing movies or music on iPod. What’s the difference? Which one is better, quicker or more convenient? Here we make some list. *Definition: here converting means converting the format of one video/audio file into another Apple defaulted format such that it can be played on iPod. *Definition: transfer data over the Internet so that it can be processed as a steady and continuous stream and displayed through client browser or program for streaming video to iPod before the entire file is transmitted. By streaming, video/audio file is sent in compressed form over the Internet and displayed by the viewer in real time. The user does not have to wait to download a file to play it. Streaming technology is more instant and convenient than video conversion, and can settle the problem that one does not have fast access to download large multimedia files quickly. Air Playit is a new-generation yet powerful video audio streaming tool for iPod. As your personal video audio cloud, it is capable of streaming 320 different video/audio formats from a disk folder or an iTunes library to your iPod. With this software for streaming audio video to iPod, you can get access to music and movie collections on your and your friends' computers. 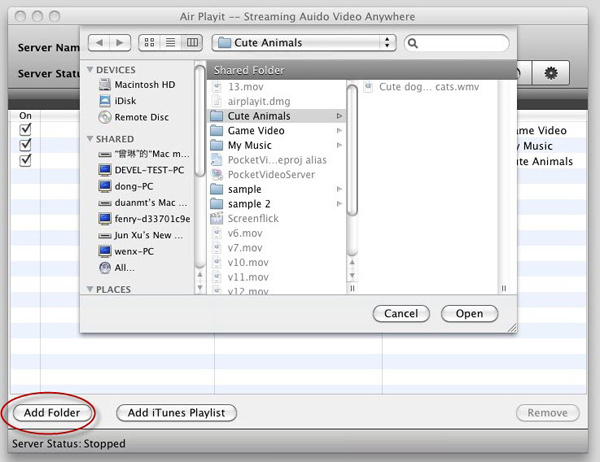 Step 1: Download Air Playit Server to your PC/Mac, and run it, click “Shared folders” and add your video by clicking "Add Folder" so that you can stream video to ipod via Air Playit server. Step 2: Download Air Playit Client App for iPod before running it. The client app can automatically discover the local network by Bonjour Server. 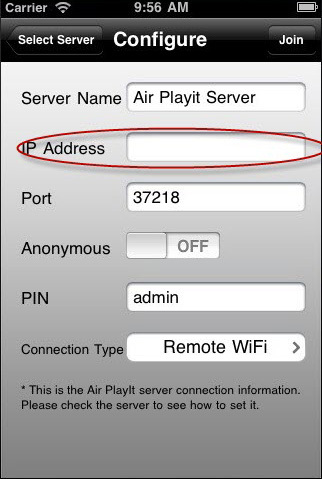 Otherwise, you need to input your server address which is shown on the main interface Air Playit server manually. Notes: make sure that you have WiFi connected; if it still fails, close the fire wall to have a try. Step 3: browse the folders under the server, click "Play" to watch video audio on iPod immediately without any format conversion or sync. Note: You can also chose "Offline Conversion" to guarantee smooth video audio playback and offline watching. 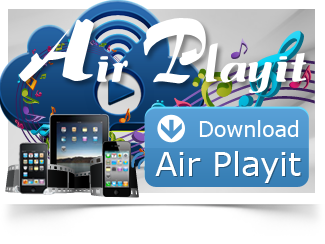 Air Playit is a free video audio streaming program. Besides iPod, it is also capable of streaming video and/or music to iPhone iPad. It is available for both Windows and Mac OS. Air Playit, free video streaming software, can help you stream any video to iPhone/iPad from your PC to bypass the troublesome sync process so that you can watch videos without waiting.